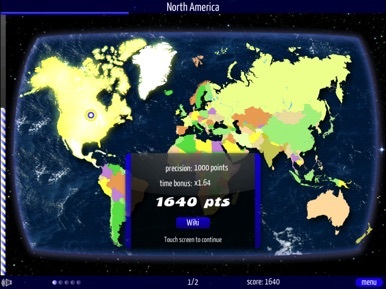 Speed Geography is an addictive game that tests your speed and challenges your memory. -Beautiful map with multi zoom levels. -Points for precision and speed. -Bonus points for five consecutive correct answers in a row or longer combos. -Scores can be compared with friends' through OpenFeint. -A magnifying glass appears when holding your finger on an image allowing more precision. -Multiple language support (currently English and French). -Additional information on countries from Wikipedia is available without leaving the game. -A friendly developer open to suggestions :-) Don't hesitate to send me an e-mail if something is missing or not quite right. If you are tackling geography for high school or university, this is a must have game that makes learning fun. The game includes a practice mode that allows learning specific regions without doing all the previous levels and a review mode that replays the mistakes made in the previous game. The lite version includes countries in North America, South America, Europe and Oceania. Try Speed Geography full version for the worldwide experience! Searching for property for sale and to let couldn't be easier. The Felicity J Lord iPad App offers the choice from Europe's Largest Independent Estate Agent and much more with information about the market in your area and alerts of new stocks. Searching for property for sale and to let couldn't be easier. The Haybrook iPad App offers the choice from Europe's Largest Independent Estate Agent and much more with information about the market in your area and alerts of new stocks.